AP EAMCET 2017 Hall Tickets: The Jawaharlal Nehru Technological University (JNTU), Kakinada has released a notification regarding the Andhra Pradesh Engineering, Agriculture and Medical Common Entrance Test (AP EAMCET 2017). On behalf of the Andhra Pradesh State Council of Higher Education (APSCHE), it announced that the admit cards will soon be available for download. “Hall tickets for AP EAMCET 2017 will be enabled from April 19, 2017, afternoon,” JNTU announced.The Candidates who had applied can download AP EAMCET Admit card from the direct link provided below from 19th April 2017. The application procedure for the same ended on March 17, 2017. The AP EAMCET engineering exam will take place from April 24 to April 27. The agriculture entrances will be held on April 28, 2017, and the entrance exams for both engineering and agriculture will be held from April 24 to April 28, 2017. The papers will be held in two shifts— from 10 am to 1 pm and from 2.30 pm to 5.30 pm. Clearing AP EAMCET would give candidates access to courses such as Engineering, Bio-Technology, BTech (Dairy Technology), BTech (Agr Engineering), BTech (Food Science and Technology), BSc (Ag), BSc (Hort), BVSc, AH, BFSc, BPharmacy, PharmaD. 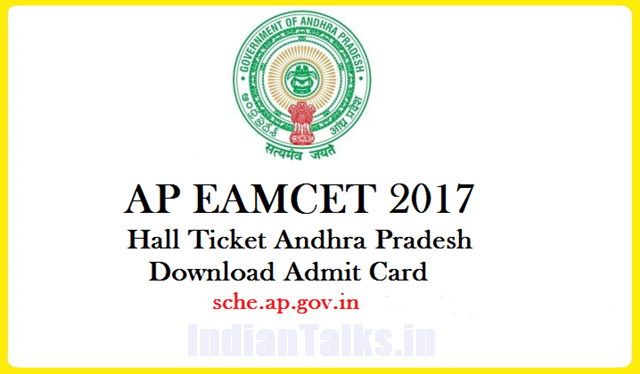 How to Download AP EAMCET 2017 Admit Card? Enter the registration number, qualifying exam hall ticket and date of birth. Remember to carry them at the exam hall. Stay tuned to for this website. We will update AP EAMCET 2017 Answer key, results here. Press CTRL+D to bookmark this page for easy navigation.